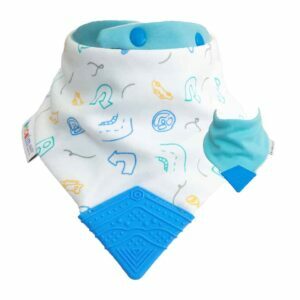 This cute 2 in 1 Bib has a yellow, grey and white design featuring Mr. Fox, you can flip it over to show off the grey reverse. All colors are perfectly matched. The yellow soft teething attachment has the perfect texture for your teething baby. There are two poppers at the back for adjustable sizing. The bib is extra absorbent with its middle layer. We offer solutions to teething babies problems with our Dribble and Chew Teething Bib by Becalm Baby. If you have a teething baby at home, you will know that it is not a fun time. Not only can they be grumpy and constantly looking for something to put in their mouth, they also dribble, often soaking their clothes! Introducing the Becalm Baby Teething bib. Designed as a wearable teething accessory, our teething bibs not only look gorgeous they are functional too. Your baby will love chewing on the soft durable silicone attachment to soothe their irritable gums, and they will enjoy playing with the texture of the teether too. You will love the super absorbent material that will keep your baby dry and you will have peace of mind knowing there will be no more teething toys dropped on the floor. Our vibrant patterns and modern designs will catch the eye and are reversible to mix and match with any outfit for the littlest fashionistas. Becalm Baby teething bibs are the ultimate in teething accessories and the perfect solution to make teething time less stressful on both babies and parents. We have designed a teething tab that has been sewn onto the teething bib. The texture of the tab has been expertly designed so that your baby will get relief during by chewing on the teether, easing those irritable gums as well as aiding your little one’s teeth to break through. The teething tab (and the teething bib) has been tested to the strict Australian Safety Standards and so it is 100% safe to chew on. The unique style of this teether allows it to stay with baby. Babies often get frustrated not only with their teething but because they cannot keep their teether with them, sometimes parents are too busy to keep picking them up and washing them time after time. Not this teether, it can stay with baby for as long as you want it to and it will never get dirty from being dropped on the floor. With its 3 layers of 100% cotton the dribble and chew teething bibs are ideal for droolers. Drool and teething go hand in hand, and often the drool can cause skin irritation if clothes become damp. This is where this teething bib steps in, it catches all the drool and absorbs it, rather than soaking through onto baby’s clothes. The style can be pattern or plain. The teething bib is reversible, we offer one side with a pattern and one plain side. Our colours are vibrant and eye catching and will go with just about anything. If baby makes a mess of one side, it can be flipped over to the other side ta dah, your baby still looks cute and trendy and can carry on Teething in Style. We use Australia Post Eparcel (5.95). All parcels are shipped within 1-2 business days and can take up to 3 business days for delivery, depending on method chosen and location. All items are shipped from our Emmaville Warehouse in NSW.